Tallahassee home values rose during the first part of 2016, but the growth was weak and uneven. Looking at Freddie Mac's Home Price Index, growth in Tallahassee home values were weaker than in 2015, and actually experienced a decline from July 2015 through the spring of 2016. Is this a trend or just a short-term decline? 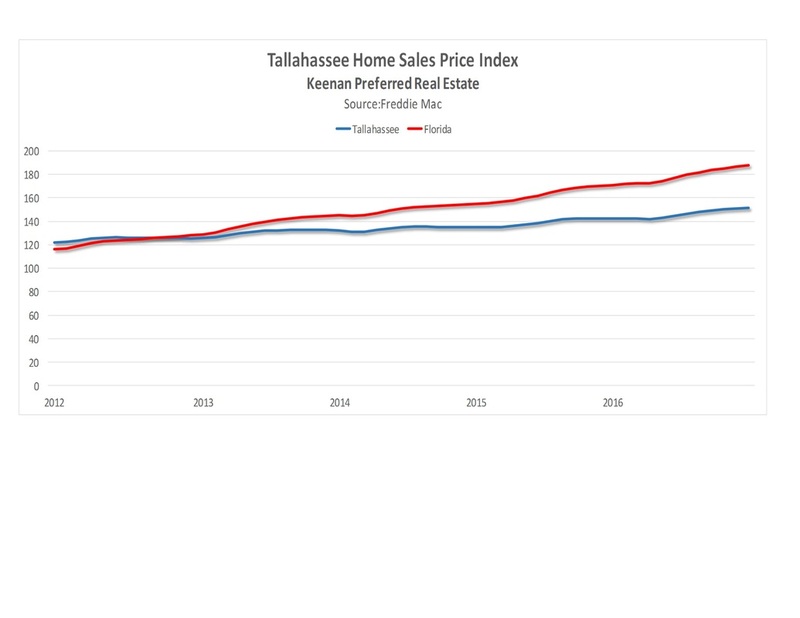 More concerning is the overall weak trend of growth in Tallahassee prices. While national values have almost reached pre-crisis levels, Tallahassee home values are still far below peak values. Based on the rate of increase, it may be 8 more years before Tallahassee reached these top values. Check out this great video for maximizing your Tallahassee home value! Even in an improving market, it is important to position your home to stand out above the rest of the homes for sale in the mind of a buyer. Home sellers who follow these tips earn a higher selling price than the average home! As overall Tallahassee home values continue to improve, one segment of the market is really soaring: new construction home values and home prices. The average price per square foot of a new construction home has risen from about $144 in 2014 to $155 in the first part of 2015, driven by increased demand for larger homes with more high-end features. It appears today's buyers are looking for homes in premier condition, and are willing to pay a premium for that. This has implications for all home sellers: if you prepare for home for sale by making it as close to a new home as possible, you will boost your home value and the home sale price that today's buyer is willing to pay. What is the Best Way to Increase Home Value? This owner increased home value by creating private space in the back. Want to know the best way to increase home value? It’s simple. Just like any other product – make it exactly what buyers want. And while every buyer is slightly different, there are broad lifestyle trends that they all follow. Here are 6 trends compiled by the National Association of Realtors that are on the cutting edge of what today’s buyer wants. Baby boomers, empty nesters, and Gen Yers are showing a preference for homes that have more private outdoor spaces, straying from the traditional "public" backyard, according to surveys. One way some builders are fulfilling this desire is by positioning the home's architecture strategically around the outdoor space to enclose it more and allow it to be more open to the interior living spaces. They also are creating more covered outdoor spaces. Besides being a place for cooking, the kitchen is also the entertainment/conversation area in a home. Open-kitchen layouts have continued to grow in popularity, putting kitchens more front-and-center and visibly exposed to other areas of the house. Kitchen islands are offering extra seating and prep space while larger pantries are offering greater storage. "As the hub, it becomes a consumer's dream to design these elements together with function, practicality, and flair," the designers say. More home owners are looking for a place for their large flat-screen television. Larger television sizes are prompting more builders to realize the need for greater wall space to hang the televisions and larger entertainment rooms to accommodate more seating. If home owners had their way, garages wouldn't be just for parking the cars. More home owners want spaces for hobbies and storage, and builders are taking notice by creating larger garages for multi-use purposes. An office and den space is becoming a bigger desire among home buyers, and the location of it in the home is becoming increasingly important. Placing the home office off the entry is no longer considered the most practical location for it, but builders are experimenting with moving it closer to the "living" area, such as off the kitchen or the family room. As multigenerational living gains popularity, builders are responding by carving out more separate spaces for several generations to live together. For example, some builders are offering semi-independent suites with separate entries, bathrooms, and kitchenettes. If you incorporate these trends into your home projects or major home remodel, you are sure to get more value when it’s time to sell. Remember, the best way to increase home value is to give buyers exactly what they want.